For most people, becoming an adult means hitting major milestones like finishing college, getting married, having children and buying a home. Retirement is probably the last thing on your mind during your 20s, especially if you're earning an entry-level salary and have student loans. But starting a retirement savings plan while you’re young can have a huge impact on your financial future, due to the magic of compound interest. A compound-interest calculator at Investor.gov shows that if you invest $5,000 at age 22 it can grow into a nest egg in excess of $250,000 by the end of a 40-year career. And that’s assuming you never invest another dollar! Just because you’ve started your first job doesn’t mean you can afford a truly grown-up lifestyle yet. It took your parents years to acquire homes, cars and the other trappings of adulthood, so don’t get yourself in debt trying to match them. Learning to live within your means in your 20s creates a good habit you’ll carry throughout your entire adulthood. You’ll be less likely to amass credit card debt or damage your credit score. And living beneath your means can make it easier to do important things, like saving for retirement and traveling. If you’re not sure where to start, check out a budget calculator to help you figure out a monthly budget. Your 20s — when you may have fewer financial responsibilities, such as kids or a mortgage — are the best time to build your “rainy day” fund. Having an entry-level salary is no excuse for not having an emergency fund, since the less money you make, the more you’ll need a cushion if unexpected financial difficulties arise. Experts like Suze Orman recommend setting up automatic transfers from either your paycheck or checking account to a savings account. You can start by transferring small amounts, but the goal is to build up about eight months of living expenses (and no less than three). Good credit is key to financial adulthood, so now’s the time to build a solid credit history if you plan to buy a house or car or start a business. While student loans can help establish a credit history, consider diversifying by opening one or two credit cards or managing another installment loan, such as a car note. Remember that building credit is a slow process — one that requires on-time payments every time — so only borrow what you can afford, and pay your credit cards off every month. And don’t forget to keep an eye on your credit report for mistakes that can damage your credit. According to federal law, consumers can get one free credit report from the three top credit bureaus per year. If you maxed out your credit cards in your 20s, it’s time to get your finances back on track. Financial expert Steve Ramsey recommends the “snowball method,” where you pay the minimum on your cards, except for the one with the lowest balance — pay that one off first. When that card is paid off, take the extra money you now have and apply it to the next-largest balance and so on. It's time to repay your student loans now that you’re (hopefully!) at a point where your income is growing. If retiring your student loan debt is possible, set up a plan to go after it aggressively. But if your debt is truly a monster, try getting on a repayment plan that makes sense for your income level. Check out the Department of Education’s student loan repayment calculators to see which plan is best for you. Now that your earnings are higher and credit card and student loan debt are getting under control, it’s time to stop renting. Start saving now for the home you (or your family) needs. Then use a mortgage calculator to determine your monthly costs based on your down payment, interest rate and purchase price. When you’re young, insurance seems like more of a luxury than a necessity. You have possessions beyond just a hand-me-down furniture, and you can’t run a mile quite as quickly as you used to. You probably have a partner, kids or even parents who count on you. Make sure you have the right amount of car, health, homeowners and, yes, I said it — life insurance — that you really need. The American Institute of CPAs can help you start calculating your needs. Though it’s never too early to write a will, it's imperative when you have significant assets or dependents. Consult with an attorney or a financial professional if you have one. If not, sites like LegalZoom can help you write one inexpensively. If you’ve been diligently saving, congratulations! But before you pop the champagne, consider that the investments you made in your 20s and 30s may no longer be meeting your financial goals. As certain assets over- or underperform, they either grow or shrink relative to your overall portfolio. That means you may have more (or less) of some assets than you intended. Rebalancing is the chance to recalibrate your portfolio to meet your current and future goals. Many company-sponsored retirement plans offer free rebalancing tools on their websites. If you’ve fallen behind on your retirement savings, don’t despair. According to IRS rules, you’re entitled to make catch-up contributions every year after the age of 50. While the annual 401(k) contribution limit is $18,000, the IRS permits additional contributions of up to $6,000 per year. That adds up to a whopping $24,000 in annual 401(k) contributions. Don’t have a 401(k)? No problem. Uncle Sam also has catch-up provisions for traditional and Roth IRAs: You can contribute an extra $1,000 beyond the standard $5,500 annual contribution limit — up to a total of $6,500 per year at age 50 and beyond. As you inch closer toward official retirement age, it’s time to begin planning how you’ll actually live during your golden years. Calculating a retirement budget is just the beginning; you’ll also want to decide whether to continue working, where to live and more: You need a plan that can accommodate your lifestyle. Mapping out your ideal retirement now enables you to better enjoy it when the time finally comes. 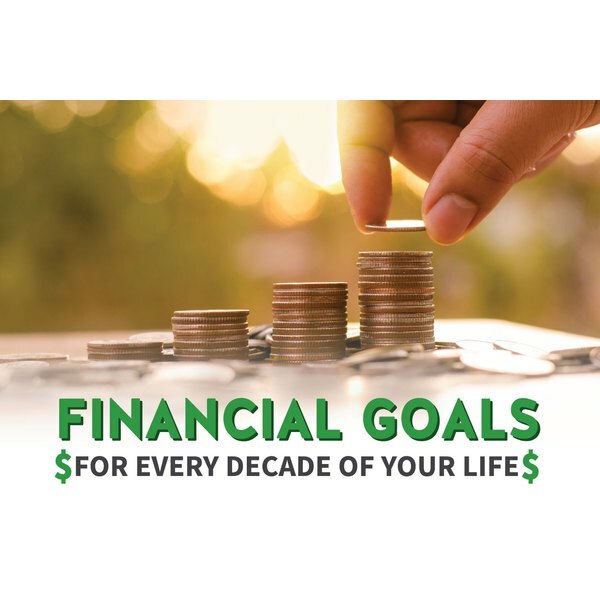 Your finances are a journey, not a destination, and each decade represents new goals to meet. Whether you’ve met each financial milestone on time is less important than reaching your personal money goals, however modest or ambitious they may be.